Star Tron® Enzyme® Formula Ring Clean+® is formulated with the latest technology for deposit control, plus a proprietary enzyme package designed to remove the toughest deposits while helping to prevent the formation of new deposits. 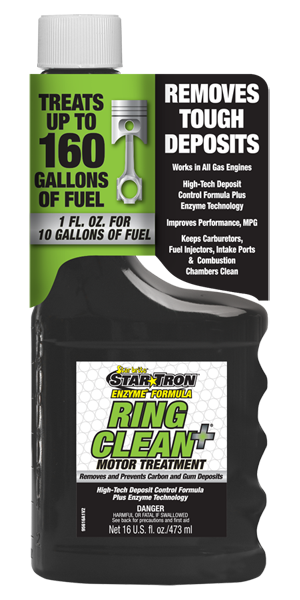 Ring Clean+® removes deposits from fuel injectors, carburetors, intake valves, intake ports, and combustion chambers that can lead to engine knock, stuck piston rings, dirty spark plugs, lost power, decreased performance and reduced fuel efficiency. Formulated to work in all boat, motorcycle, car, truck and outdoor power equipment engines.